Creating your loose cushions for any piece of furniture or project. Made in the UK using traditional skills and techniques to make your bespoke product in a wide choice of styles and trimming. A unique tailored cushion at affordable prices and unbeatable quality. Cushion inners made to your exact specification for any piece of furniture that requirers a new or replacement. Vast range of filling for you to choose from, including natural, synthetic and foam including dacron and stockinette. Now you can even choose wrap cushion inners for the ultimate luxurious low maintenance experience. A bespoke service second to none! From replacement inners for suite cushions, the finishing touch to a bespoke seating area or a simple scatter cushion for decoration, your design will be made by a dedicated craft team all working hard to make your design come true. Cushion inners and covers designed by you to your exact specification, made by us and delivered straight to your door! If you would like to see some of the cushions we have made for our customers why not checkout our Portfolio. Bespoke cushion inners, any size, any shape! If you need replacement cushion inners for your furniture we can make any type of cushion in any size or shape in a vast range of fillings! To use our bespoke cushion inner service to create a cushion inner to your exact requirements, please choose the type of cushion you require from one of the above sections, then navigate to the Free Quotation tab and simply fill out the form. If you would like to learn more about what cushion fillings are available for our cushion inners why not visit our Fillings Guide. ✔ Choose from our loose fillings of synthetic fibres, natural feather mixes or wool. We also have a choice of foam fillings in different densities or you can get the best of both with feather/foam wraps. ✔ All of our cushion inners are generously filled with our loose fillings and even foam is covered in dacron to give a more natural plump look and soft rounded corners. ✔ Your cushion can be made in any shape or size you need to fit your exact requirements. ✔ Redesign the look of your furniture by reconfiguring the cushions. i.e. if you have one long cushion you can split it into two or three or alternatively if you have three small cushions you could turn them into just two or one. By changing the design combinations you can achieve a new look and feel. ✔ The cushion inner has no border, it gets its depth from the filling and domes in the centre and gets flatter to the edge e.g. (just like a pillow). ✔ The cushion inner has a border around the edge that can be made to any size. If you are replacing a seat cushion inner it is most likely boxed edge. ✔ All of our loose filled suite cushion inners are channelled to ensure even distribution of the filling, keeping it in place and aiding in support and comfort throughout the duration of its life. ✔ All of our natural filled inners are covered in a feather proof waxed cotton cambric to stop feathers protruding through. ✔ All of our loose filled cushion inners are sewn using heavy-duty thread to ensure that the cushion inner can cope with high impact and the strain of constant use and wear and tear. 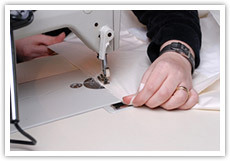 ✔ Fillings, fabrics and trimming can be configured in many variations to suit any budget and cost restraints. ✔ Your cushion will have a standard manufacturers guarantee of 2 years and a quality seal of 5 to 10 years. We pride ourselves on making beautiful covers for any cushion product, knife or boxed edge whether it's for your home or garden. We have an extensive range of fabrics to choose from including fabric for outdoor. Bespoke cushion covers can even be made from your own fabric! Enhance your cushion cover with trimming, from beads to pom poms or classic piping. Get expert advice as you design your bespoke cushion cover, we will guide you through the process step by step, ensuring your cover is perfect! If your not sure what the difference is between boxed and knife edge cushions or are unsure what a wrap cushion is why not visit our Cushion Guide. ✔ The cushion has no border the two panels of fabric are just sewn together. A good example of this is a scatter cushion cover. ✔ The cushion cover is made up of two fabric panels and a strip of fabric that goes between the panels creating a border around the edge that can be made to any size. ✔ We stock the UKs leading suppliers in fabrics which boast an impressive array of patterns, stripes and plains all in a vast range of colour shades. You can choose from our range of upholstery fabrics or you can supply your own. ✔ All of our cushions are made to meet UK Fire Regulations for domestic and commercial applications. If the fabric you choose does not meet fire regulations we will add interliner to bring your product up to UK Standards. ✔ All of our covers are made using high quality heavy-duty upholstery thread to ensure the cover can withstand the constant wear and tear generated through constant use. Nylon thread is use for outdoor cushions as it's also UV and mould resistant. ✔ Where fabric is washable and suitable for dry cleaning we will always overlock seems to stop fraying. ✔ With the option to add piping you can achieve a more defined finish or add impact by choosing a contrasting colour. Our piping cord is supplied suitable for cleaning as standard. ✔ All covers are supplied with zips as standard for easy removal for cleaning and maintenance. ✔ With a choice of ties, loop fastenings and velcro there are many ways you can fix your cushion to your furniture. To obtain a quotation for bespoke cushions. You will need to measure your cushion covers, No templates are required for cushions with straight sides, however any curved shapes will require a template, which you can make out of wallpaper, newspaper or plain paper. If you have no cushion or cover to measure, then the space for which you require a cushion will need to be measured to receive a quotation. Lay the cushion cover on a flat surface, measure from corner to corner along the seam. Pull the cover slightly to remove any creases the cover may have. Do not measure across the centre of the cushion as this may have a slight dome to it and this will affect your overall length and width measurement. When measuring the depth double check in several places as the cover may have distorted over time. For square or rectangle shaped cushions measure the length, width and depth. Please mark on your template or drawing where the zip is located. Curved and shaped cushions will need a template. (See how to make a template). For tapered cushions (i.e. the front of the cushion is wider than the back) measure all four sides and note where the angles are. Lay a sheet of paper flat on the floor and place your cushion cover on top of the paper. Draw around the cushion cover, keeping as close to the seam/edge as possible, making sure it's identical to your cushion shape. Mark where the zip is located on the template. Carefully cut out the pattern. Place your template on to your chair/sofa to check for a correct fit. Make any adjustments as necessary. Sometimes, well worn cushions become misshapen. To restore to the original shape, the template will have to be symmetrical (right side same as left) to equally balance the cushion; fold down the middle, cutting where necessary so both sides are the same. Please mark your template with your name and address. Once you have measured your covers there are many ways in which you can obtain your quote. If you are sending anything to us by post, please remember to clearly state your name, address and contact telephone number. When posting covers we recommend that they are sent by recorded delivery. Remember to make sure that your measurements are from your outer cushion cover (including the depth of the border). We will make the inner cushions larger “to push out” the outer covers. Ensure that you state if you require a quotation for a cover or inner or both and whether your measurements are in centimetres or inches and which style of cushion you require (seat, back, scatter etc.). All of our cushions interiors are covered with a feather proof waxed cambric to prevent feathers from protruding through your covers. When we have the measurements of your cushions we will contact you with a price. Only after you have placed an order with us we will process your cushions and you will receive them within 7-10 days. For cover orders please allow longer. As bespoke item prices vary considerably according to size, weight, fabric and filling we apologise that we cannot offer prices on our website. Delivery charges for bespoke items will be stated upon price request. If you have any questions or concerns regarding bespoke cushions and covers please call us and speak to one of our friendly staff who will be more than happy to help! To help make the process as easy as possible, we have specialist forms to fill in that include all the relevant information we need to process your quotation as quickly as possible. It’s easy to get a free quotation for a bespoke cushion, simply follow the free quotation link on the relevant bespoke section, fill in the details, submit and wait for your free quotation! We will normally respond to enquires within a day, but please be aware that for complex quotations or when we get busy it may take a couple of days to get back to you. Please make sure you have read through the order enquiry tips section first so you know all the relevant information you need to input before you fill in the form. For any other questions or queries please use our contacts page. We look forward to hearing from you soon.